Unlock your Sony Xperia without voiding the warranty. 100% online; no need to send your phone anywhere. Unlock any Sony Xperia phone or tablet with doctorSIM. Sony recommends using this method. How to unlock my Sony Xperia phone with doctorSIM? Once you've requested your unlock code, you will receive simple step-by-step instructions explaining how to enter the code into your Sony Xperia. Your Sony Xperia cell phone or tablet will be unlocked in a matter of minutes! Do I have to specify the exact model of my Sony phone or tablet to unlock it? There is no need to specify the exact model of Sony Xperia when you request your unlock code through doctorSIM. Simply send us the correct IMEI number by typing *#06# on your phone's keypad and make sure you've checked you have unlocking requests left (see question below). However, if you need to know the model of a Sony Xperia device for any other reason we recommend using our identify Sony Xperia model check. How do I check how many unlocking attempts my Sony Xperia has remaining? 1. Press the Home button once. 2. Press the Back button twice. 3. Press the Home button once. 4. Press the Back button once. 5. Press the Home button twice. 6. Press the Back button once. Once you have accessed the service menu, check the number on the first line next to the word Network. That is the number of unlocking attempts your phone has remaining. 1. Turn on the phone with a SIM card inserted (this is important, because without a SIM card you may be told you have unlocking attempts remaining when in fact you do not). 3. Select Service Info/Sim Lock. Look on the first line (Network). 4. If there is an X and a number that is not 0, you can unlock your Sony. 5. If instead, you see a 0 you will not be able to unlock your phone. I don't know the original operator of my Sony Xperia phone. If you don't know to which network carrier your Sony Xperia is locked, select Network Operator Unknown or Not in List. However, knowing the original operator of a Sony Xperia could mean paying a lower price for your unlock code. We recommend finding out to which network carrier your phone is locked by using our Sony Xperia carrier finder. What is the difference between Sony Standard and Sony Premium? Our Sony Premium Service scans a wider range of databases and is the recommended option if you don't know the network provider to which the phone is locked. This service has a 99% success rate. Our Sony Standard Service scans a reduced number of databases located worldwide and has a very high success rate. However, if you know to which network provider your Sony is locked and are in no rush to unlock the phone, we recommend choosing this option first. If your Sony cannot be unlocked using our Standard Service for any reason under doctorSIM's responsibility, we will issue you a full refund so you can request our Sony Premium Service. How long will it take to unlock my Sony Xperia? The guaranteed delivery time will appear on the screen when you select the country and network carrier the phone is locked to. We will also inform you of the average delivery time once you have provided all the information required to unlock your Sony Xperia. Where can I find the price for my Sony Xperia unlock code? Similar to the time frame, the cost of your unlock code will appear on the screen when you select the network provider and unlocking service. What happens if the software of a Sony Xperia smartphone has been modified? 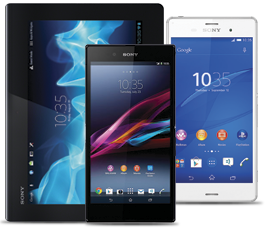 doctorSIM guarantees 100% that our method of unlocking Sony Xperia cell phones and tablets will work with all original software and future updates. Unfortunately, we do not take responsibility if the phone has been modified in any way. You will need to restore the phone to factory settings and assume the risks of having possibly altered key components of the phone required for a successful unlock. How do you unlock a Sony Xperia phone? To unlock a Sony Xperia: First, access the phone by typing your PIN. Then insert a SIM card which is from a network carrier different to the one the phone is locked to and type the unlock code. The unlock code will be provided by doctorSIM and will allow you to use your Sony Xperia on any compatible GSM network in the world. 100% online so you can continue to use your Sony Xperia during the unlocking process. Our method is recommended by Sony Xperia and the network carriers. doctorSIM's unlocking method guarantees you won't lose the warranty. Our permanent unlock codes work for international use in any country in the world. Our unlocking services are available for all Sony Xperia models. All you need is an Internet connection to unlock your device. If an unlock code for your Sony Xperia phone isn't available we'll return your money. We have the best prices online.